Learn more. Know more. Be more. If you’re looking to increase the amount of magnesium rich foods in your diet, you’ve come to the right place. 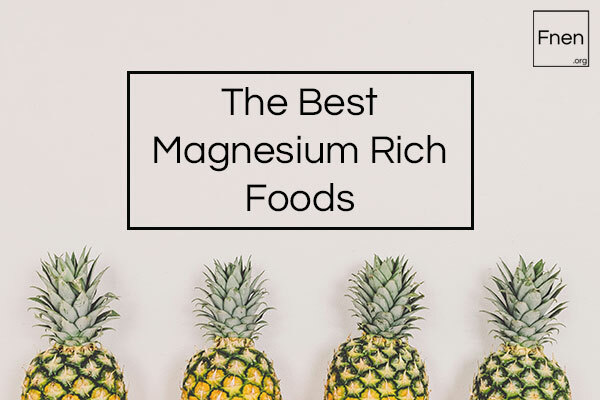 Using data provided by Cedars-Sinai Medical Center, we’ve compiled a full list of the most magnesium potent food you could easily add to your diet. All the foods we’re listing should be available from your local grocery store. How much magnesium do you need a day? In short, you need 310 mg – 420 mg per day. However, it can depend on numerous factors such as age and gender. This, combined with the magnesium rich foods we list in this blog. Should give you a good idea of how to get the right amount of the mineral. Make no mistake, you need magnesium to maintain a good standard of health. You need it for nerve and muscle function, bone health, heart health, the immune system and even sleep. Now, let’s look at the food. 1 How much magnesium do you need a day? 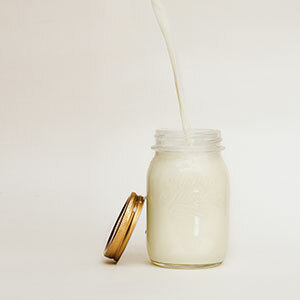 Also known as whole milk, regular milk is one of the best magnesium rich foods. It’s arguably one of the most common dairy products on the market. Although regular sometimes get a bad wrap for being associated with a higher fat level – this doesn’t mean it will make you fat. Research from the Archives of Disease in Childhood find that using regular milk can actually reduce childhood obesity. This is mainly because lower-fat alternatives in the dairy industry like yogurt is loaded with sugar. This makes whole milk one of the better options for magnesium and for keeping your fat levels down. Regular milk’s less fat relative. Although skim milk has much less fat, it still has a lot of magnesium. Although it doesn’t have the full fat benefits of whole milk, it still contains a good amount of protein, vitamins and minerals like calcium. These can all contribute to a healthy life, building muscle mass and protecting bones. It also has less calories that regular milk, which is great if you’re on a calorie restricted diet. Technically not a dairy product, however, we wouldn’t count it in our ‘meat’ category either. Regardless of the details, eggs are one of the better magnesium rich foods. Eggs are great for getting a good supply of vitamins, proteins and minerals. They contain Vitamin D, B2, B6, B12, Zinc, Copper and Iron to just name a few. The British Medical Journal suggests that one egg a day may help reduce your risk of heart disease and stroke. Not only that, there’s are endless ways to serve them! The majority of this list all appear to be seafood, with shrimp being the most magnesium rich food. Shrimp may have a lot of magnesium in it, but it also has several other benefits that make it great for your health. It contains a good amount of protein along with omega-3 fatty acids, antioxidants and iodine. Iodine has been seen in numerous studies to help promote brain health (study). 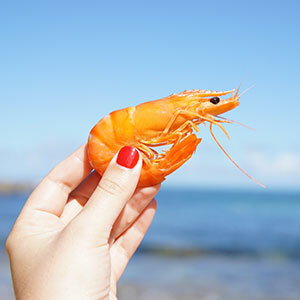 Overall, shrimp is a good choice for both your magnesium levels and mind. Another magnesium rich meat – another seafood. Tuna is a highly nutritious fish, containing good amounts of fats, protein, vitamins and minerals. It also, like shrimp, contains a good amount of omega-3 fatty acids. This can be great for eye health. A study from the National Eye Institution (NEI) found that omega-3 fatty acids can help to reduce the chances of age-related macular degeneration (study). However, there is always an issue with the mercury in canned tuna. This is due to how it is handled to can it. For the healthiest option we suggest fresh, unprocessed tuna. Our final magnesium-packed meat is Cod. It’s almost exactly the same amount of magnesium that you would get in the same serving of tuna fish. So, what does Cod have that tuna doesn’t? It’s more friendly to a calorie restricted diet. Although tuna may have more nutrients, minerals and vitamins when stacked up against cod. Cod has far less calories. 8 oz of tuna is approximately 315 calories, whereas the same amount of cod is only 238. Ah yes, one of the best magnesium rich foods to start your day. Oatmeal can be cooked in many ways, on the hob, in the microwave or even overnight in the refrigerator. It’s a nice natural food that has numerous other health benefits besides providing you with magnesium. For example, oatmeal contains the antioxidants called avenanthramides. Avenanthramides can lower blood pressure and improve nitric oxide levels which helps overall blood flow (study). For a double-kick of magnesium, you could even cook it up with some regular milk! Not as much magnesium content as oatmeal, but still very dense in the mineral. 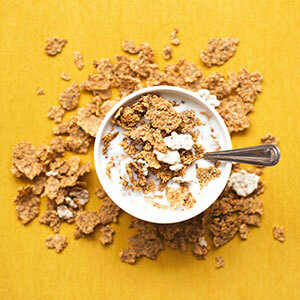 One of the main benefits that bran flakes have going for them is their high amount of fiber. This is great for your overall digestive health. The fiber in bran flakes is insoluble, this helps to improve the bulk of your stool which helps speed it along through your digestive system (study). It also contains a good level of prebiotics which can help the healthy bacteria in your stomach (study). Again, another cereal that is a great source of both magnesium and fiber. Puffed shredded wheat is another option that you’ll regularly see on the grocery store shelves. One of the main things you have to remember is to avoid the “frosted” options, or anything that comes with added sugar. Sugar in your cereal may taste great, but it does you more harm than good. Studies from the American Heart Association show that sugar is bad for you heart, weight and Americans are eating more and more every year (source). Be vigilant when cereal shopping. Used in many different Asian dishes, and sometimes even more western ones like stroganoff – egg noodles are one of the great magnesium rich foods. Thick and filling, they are a good base to lots of dishes. They also are rich in nutrients. Egg noodles contain a good amount of Vitamin B. Vitamin B, which can help with both your appetite and energy levels (source). Enriched rice is typically white rice that contains added vitamins and minerals. This explains why it’s a great source of magnesium, but also why it contains almost 10% of your RDI of iron (source). Iron has numerous benefits in your body, including improving your immune system and reducing fatigue. It’s good to get that extra shot of it from enriched rice, as well as the magnesium it contains. Due to many of the nutrients being lost through the refining process, you’re better off with wheat bread over white bread. Wheat bread contains numerous additional vitamins and minerals compared to it’s paler counter-part and is the far healthier choice. 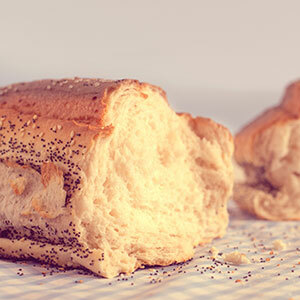 If you’re in the kitchen and ready for a magnesium rich sandwich, you’re better off with wheat over white. One of the best tasting juices (in our opinion) and a very magnesium rich juice. Pineapple isn’t just great tasting and a fantastic source of magnesium – it can also help you in other ways. The secret weapon of pineapple is bromelain, an enzyme in the fruit which has numerous benefits. The main way it can help you is an anti-inflammatory. It’s so potent that studies suggest that it may even help to treat osteoarthritis (study). Research is still ongoing, but it is looking promising as a natural aid for the condition. Again, another great source of magnesium, which comes with it’s own unique benefits. 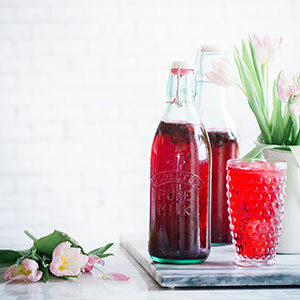 Prune juice may not be on the top of everyone’s list when it comes to beverages – but it is a healthy remedy. Studies show that the antioxidants and soluble fiber in the juice can help to reduce and regulate your cholesterol down to healthy levels (study). This has the extended benefit of helping your overall heart health, reducing the risk of strokes and heart attack. The juice in our list of magnesium rich foods. But what else can it do beside give you a good amount of this mineral? It is jam packed with nutrition. Arguably, it’s one of the most nutritious fruit juices available. Vitamins, minerals, antioxidants and even lycopene. Lycopene is a very potent antioxidant. In the American diet, tomatoes appear to be responsible for 80% of the lycopene you get in your diet. Good amounts of lycopene can help reduce your body’s overall oxidative stress and help fight a myriad of conditions including chronic diseases and may even help against cancer (study). Many refer to it as a “superfood” and we can understand why. It wouldn’t hurt to get more of this fruit juice in your diet. It’s a magnesium rich fruit, but it’s also got a ton of other nutrients too. The main nutrient that bananas are most known for is potassium. Potassium is an essential macromineral to your body. There’s even a study that shows it’s that effective a high dose of it can reduce overall risk of mortality by 20% (study). It’s pretty rich in our diets already, as approximately only 2% of Americans are deficient in potassium. As for bananas themselves, they’re a great tasting healthy snack and easy to carry around for a magnesium boost on the go. Another great source of magnesium, and another healthy choice in general. Our favorite type of cherries are tart cherries. They’re packed with numerous nutrients and minerals, including melatonin. 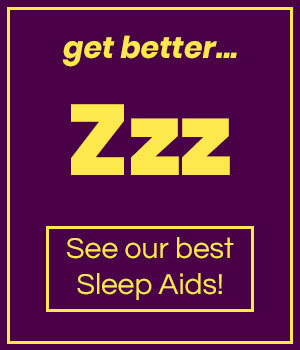 Melatonin is your body’s natural sleep hormone. It gets released from your brain and sends signals to your body that it’s time to go to sleep. 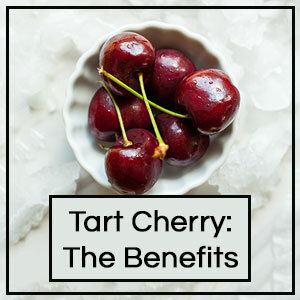 By using something like Tart Cherries to help boost your melatonin levels, you can help speed up how quickly you go to sleep and improve the overall quality. If you haven’t already, we suggest reading our benefits of tart cherry guide. It does a lot more than help sleep. 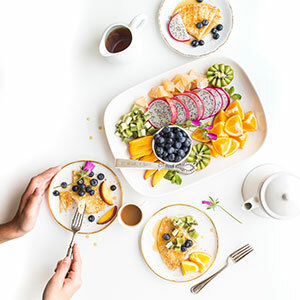 It may be one of the more… interesting tasting fruits in our list magnesium rich foods – but the science for grapefruits helping health is definitely there. For starters, it’s high in Vitamin C which can give a big boost to your immune system (study). It’s also great for keeping you hydrated. For example, a grapefruit is 88% water. This means that a medium grapefruit holds the equivalent of 8 oz of water (source). It’s definitely worth considering when you’re parched and there’s no beverages in sight. 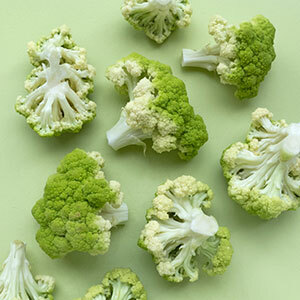 Broccoli has been often referred to as the vegetable that kids hate the most – but as an adult you need to love it. 102 mg in a single cup. That is an exceedingly magnesium rich food. Not only that, broccoli has a range of health benefits you should get in on. It’s got a great amount of Vitamin K, C, fiber, potassium and folate (Vitamin B9). Some studies even show that it can help to reduce your overall risk of prostate cancer (source). This is one of the greens you definitely want to be eating. Not nearly as potent for magnesium as broccoli, but 64.8 mg is still a lot of the mineral per cup. What the peas do have though that broccoli doesn’t is a high protein level. At 8 g of protein per cup, peas are great for helping you build muscle, burn fat and even suppress your appetite (study). Pea protein powder is quickly becoming a favorite among vegan bodybuilders, and with the additional nutritional benefits of the magnesium it’s a great option. The final in our top 3 of magnesium rich vegetables. Beets are a great source for the mineral, however there are several other ways this vegetable can improve your health. Beetroot juice is commonly used by athletes to improve their performance. The main way it works is by increasing your overall oxygen use which can help you train for longer. This has been seen in several studies (source). For the best results, it’s recommended that you take beetroot juice a few hours before performing. We really did save the best for last didn’t we? 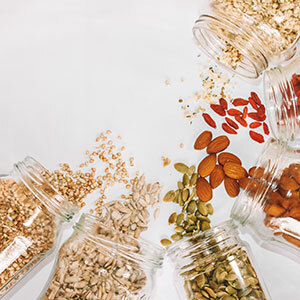 That’s right, seeds and nuts have way more magnesium than any of the other foods we’ve mentioned by a mile. A quarter cup of sunflower seeds pack 128 mg of the mineral. Not only that, they’re great for Vitamin B, Zinc, Manganese and Copper. Eating sunflower seeds can help your testosterone levels, due to it’s high amounts of zinc. Studies show that it is great for modulating your amount of the male hormone when you have optimum levels of this mineral in your system (study). Not only a magnesium rich food, but also a great source of fat. 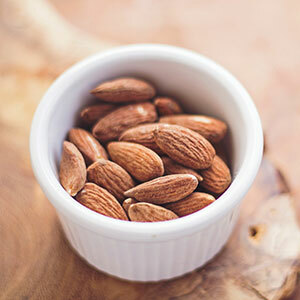 With 45 g of fat to a cup of almonds, they’re some of the fattiest nuts around. However, it’s important to note that these are healthy monounsaturated fats which have links to improving weight loss (study). The final magnesium rich food in our list – roasted sesame seeds. These guys have plenty of benefits; they’re a great source of fiber, B Vitamins, antioxidants, protein and more. In addition, sesame seeds can even help control blood sugar levels. They’re low in carbs, while being high in both fat and protein. This can help to reduce and support your blood sugar levels (source). Magnesium is an important mineral to your body, and one that is essential to it functioning properly. There are no excuses when it comes to getting it into your diet. All the foods that we have mentioned here are magnesium rich and easily accessible at most grocery stores. 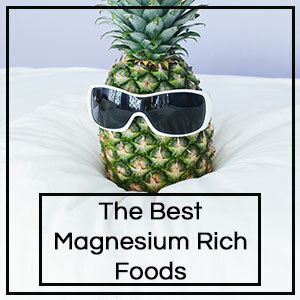 We hope this article has given you the information you need to pad out your diet with some delicious foods to keep your magnesium levels high and healthy.